I hate to see waste. So when I think of/up or see or hear of ideas to use things/items that are normally ruining the environment, I am all for it. Here are a few ideas for Old Tires, from Bicycle to large Tractors, the old tires have their uses. 1. Many people, and I am sure they designed them to fit, put their animals feed buckets and bowls down into used car or truck tires so that the animals do not knock them over or step into them. This also keeps the bowls and buckets from blowing away. 2. A bucket set down not into a tire, or even the tire alone, can hold top soil for gardens, or flowers. 3. Stand some up in a row, bury them "just enough" for a short Dog Agility Tunnel. 4. Bury Old Tires just a bit, end to end, to mark a parking area at your place. 5. Pull one or more behind your truck to plow the roads of snow. 6. Make a Frame and set an Old Tire up for an Old Fashioned Agility Tire Jump. 7. I lay several Old Pick Up Truck Tires down about 6' apart on the ground to train puppies back foot placement. They also learn to go over items this way. 8. I have seen fences built out of Old Tires. Some were bolted to others for height. 9. Mark boundaries with used tires. Maybe you do not want a fence, but need something to mark the boundary. You could bury or just set a row of used tires right along the line. 10. We live in an area of high winds all year. With storms and in the winter it is normal to have 60 MPH winds. There are no trees or buildings to block it out here. So Deron sets old tires down on wood and or our sheets of metal (when he is working on buildings and it is not on yet) so that it does not blow away. 11. Use for chairs in a picnic area. 12. People out here in NW SD paint "NO HUNTING" on old tires and hang those tires on their fence posts. 13. Set them up for Driving Practice in a parking lot (closed area) for new drivers. That way if the new driver does hit them, no harm will be done to the vehicle, the people involved or the items hit. 14. Set some up, laid down, touching tip to tip, with two side by side, for a Human Agility Run, run through them with each foot going into each of the tires laying there on each side as you run it. Think Athletic Training like the Pros. 15. 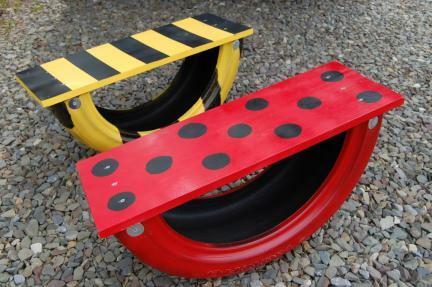 Use for a piece of training equipment for any sized animal, use the size tire needed for the job you are teaching. Train your animal (dog/goat/donkey/horse/any animal) to stand on a tire that is laying down on the ground. Use it as your "target". Have the animal stand on the side of it, or with it's front feet in the center of the tire. 16. Fill with concrete to make stepping stones. 17. Screwed together, a whole lot of tires, can be made into a Round Pen for training Equine or other animals. 18. Of course we have all taken a ride on a Tire Swing hung in an old tree with the shade of it cooling us on a Summer day. 19. Cut a few Old Tires apart to make Fancy Tire Swings. 20. Cover tightly with leather or canvas and make a drum. 21. Use for shooting practice target. 22. Set up and use for a game, throw balls or kick cans through the middle. 23. Make your own Sandals for Shoes and cut an Old Tire for the Sole of the Shoe. 24. Stack up kinda weaving the Old Tires to put up a Barrier, better than a Privacy Fence. (I would be a bit concerned about Mosquitoes, Mice and Rats, as well as other Pests with this set up...but I guess others are using it. 25. When I was a kid Old Tires were buried about half way into the ground around and near Playgrounds. We had a good time climbing on them, running across them and jumping over them. 26. Use one Old Tire, if nothing else, to have your Dog Jump Across for fun. Animals like children love this sort of thing. 27. Leave all four of the Used Tires in the back of your Pick Up Truck for traction weight when you go and buy new Snow Tires. 28. Cut Old Tires across the tread. Lay them out for a walk, like a Side Walk to your home.....keep your feet clean in the mud. 29. Paint a few and stack them or arrange them for Lawn Art. 30. Hang a couple of Old Tires to the side of a Sturdy Garage outside wall. Fill the bottoms with dirt and grow Flowers in them. 31. Paint several White and Build a Man....think Snow Man, but he sells tires. 32. Send the kids out, in old clothing, give them 3 or 6 Old Tires and have them move them about 1/4 mile. Then ask them to bring them back to where they first were. It will keep the kids busy and they will get a "good work out". 33. People have actually built homes and shelters using Old Tires for their primary materials. 34. How Red Neck Are You? Use a stack of Old Tries for Chairs on your Front Porch. 35. With heavy chains you could hang one from your ceiling after you add the wiring and lights to it. 36. Use several in front of a door to keep people out. 37. Cut an Old Tire in half, Paint it with Bright Paint and make a Child's Sea Saw out of it....and plan to be there with the kids as they use it. 38. Bring Home Four Old Truck Tires the same size. Have a Yard Party and tell everyone to wear older clothing. Have Push the Old Tires Relay Races and other games using the tires. They kids will have a great time. If you serve Alcohol the adults will love this game for hours and even invent other games using the tires. 39. Clean up an Old Tire and Paint it White. Cover it with a Woven cover and sitting it sideways, on legs, make a Foot Stool out of it. 40. Find a pan or shallow bowl that will fit inside the opening of the Old Tire. Put the old Tire up on legs and make a Bird Bath out in your yard. 41. Use several to block your Drive Way either when you Black Top it or when your neighbors have big parties. 42. Take several and stack them up, divided by four, and place a sheet of plywood over them, making them the legs to an outdoor table. 43. Use Several, dug in a bit, standing side by side, set far enough apart for the front end of Bicycles for a clever Bike Rack. Paint the Old Tires to make it look even nicer. 44. Cut several Old Tires apart and weave a Door Mat for a mud grabbing rug before folks come into your house. 45. Cut, Paint and add a board to fit to make Festive Outdoor Chairs. 46. Drag several in a "Daisy Chain" (one behind another) to put in a Path Around your fields or property. You can also do this to clear a camping site...on your own property. 47. Take them down to the Recycling Center so that they can be used to make other products. 48. NEVER EVER EVER "DROP THEM OFF" ON SOMEONE ELSE'S PROPERTY! 49. Cut across the tread of Old Tires to lay and screw them down to wooden steps for better grip when climbing them. 50. Bolt many Old Tires together, build Frame Work or a wall to attach them to for climbing on. This is great for not just children. Adults can use the Work Out too. 51. Hold back a wall of earth by stacking Old Tires up against it. You could also concrete the tires and Paint them after. 52. Clean up and Paint an Old Tire. Stuff a Cushion in the Middle and let your Dog Have it as a Bed. 53. Set Several Old Tries side by side, fill with sand and let the kids play in them. 54. Cut several apart across the Tread and use for animal tread in Barns or for a ramp into your Horse or Livestock Trailer. 55. Need a really good Work Out? Drag a Tire as you Walk or Jog. Drag the tire on it's side that you have attached a Rope to and are either pulling it with your hands or have it tied to your THICK Work Out Belt. 56. We used to Drill a hole into the middle of the Tread of an Old Tire. We attached a Rope by pushing the Rope through the hole and Tying a very large knot. We used this to teach our Dogs to Weight Pull. You can add weight later when the dog becomes stronger. 57. Stack up a few in the corner of your Garage. Place items you would like to hide in the bottom. 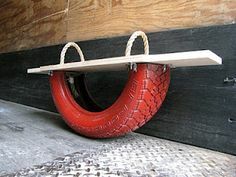 Place a tarp or cut to size piece of wood over the valuables, add more tires to make it just look like a stack of tires. 58. Goats and Dogs love to jump and play. Build a Playground using Old Tires in a Penned Area for your own animals. 59. 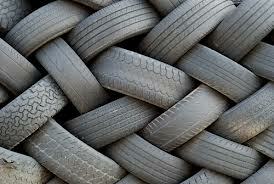 Read up on Rubber Recycling, you might be surprised at all they do with Ground Up Old Tires. This will give you a Conversation Starter. 60. People are carving the Tread for Art. Kinda like the Chain Saw Art on Stumps. 61. Fill several with Gravel, after you have stacked them up on a hill for steps, for a safe way to climb up that hill and keep the mud from it from sliding. 62. Wrap Rope around the Tire, inside then out and around, round and round and round. Make a Clean and Interesting Seat. Use Indoors or Out. 63. Use an Old Tire for the Stable for a Sea Saw. Fill with concrete to stabilize the Tire so that your whole Sea Saw is Stable for use. This is fun for children and or Dog or Goat Agility. 64. Attach Old Tires to Teers or Docks so that when Boats come in, if they hit them there is no damage. 65. Set Up Old Tires on an Empty Parking Lot for a Bike Course for kids....remove and take the old tires with you when you are finished. 66. 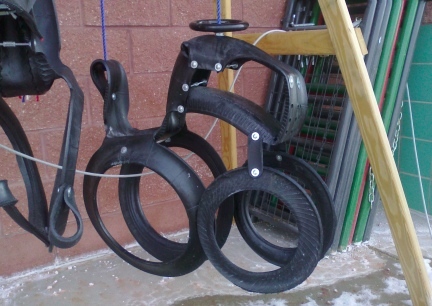 Use a Half Of An Old Tire Hung on a Garage Wall for a Place to wind your Garden Hose around for Storage and Drainage. 67. Stack up two or three and put your Gargage Can inside of them. Use this for Bar-B-Ques and other Outdoor Parties. 68. Set up two or three on top of one another and put a Trash Can Liner down inside the hole. Secure the Trash Bag to the Tires with Duct Tape. Use this for an outdoor event. When the Party is over, remove the tape, pull out the Trash Liner and put your Old Tires away until next time. 69. Set them up about 50 yards apart and have the kids run around them. Time the kids for fun and contests. 70. Put your Tarps over items in storms. Lay Old Tires down over the ends of the Tarps to hold the Tarps down....remember, you will need several Old Tires for this. 72. 71a) Make your Poles Tall enough so that Two of the Old Tries set up across from one another with a Line or rope could become a Clothes line. 73. 71b) Put a Snap on the top of one of the Poles to make a Tether Ball Holder. 74. 71c) Add eye bolts to the top of several Old Tires with the Concrete Centers and buy Plasitc Chain. Use as a Barrier so that no one can pull into your driveway. 75. 71d) Cap the Poles so that there are no sharp edges and use the Old Tire set up near the area kids play. When the Spring Day warms up, they can hang their jackets on the Pole. As it cools back down, the kids can easily find and put on clean jackets. 76. 71e) Two of these Old Tries with the Poles could be the Center of a Tarp Pup Tent for the kids to play under or anyone to enjoy the shade outdoors with. 77. 71f) Plastic Snow Fencing added to a few of these Old Tires with Poles, can become an animal or toddler barrier.....make sure neither tries to hold onto or pulls at the fencing or Poles. And for those that like to blame others for everything and sue the innocent that are no where around when things go wrong....because those same people were not watching their own......DO THIS AND ALL APPLICATIONS ON THIS PAGE AND ALL OTHERS AT YOUR OWN RISK. 78. 71g) Very Tall Poles with Snaps, in the concrete middle of your Old Tires, could become the Net Holder for many Games including buy not limited to, Volley Ball. The contents of this page for 101 Uses For Old Vehicle Tires is still under construction. Please check back later!